Selecting the “Right” bicycle saddle! Are you having trouble selecting the “right” bicycle saddle? Well, we think we can help! Selecting a saddle is arguably the most personal component choice made by any rider. That’s why every Bontrager saddle is backed by the Unconditional Comfort Guarantee — so you can be confident in your choice. Why take chances on which saddle might be the perfect match for you? 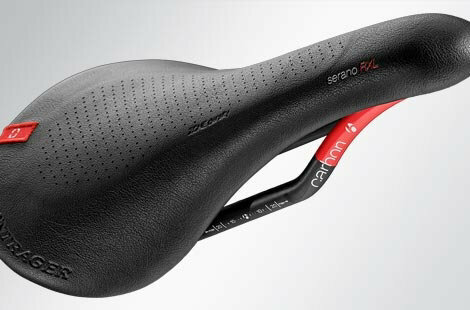 Bontrager has taken he “guess work” out of selecting a new saddle. NEED HELP? Find the right saddle for you with our Saddle Selector. Click here to begin! I get a numb crotch while riding. What’s the cure? Some of the things that can cause this painful problem include: a seat that doesn’t fit your anatomy correctly; riding in shorts that have seams in the crotch pressing on nerves and slowing or stopping the circulation; too high a seat; an angled seat that doesn’t support you correctly; and riding in one position for too long without standing or moving around. That’s a lot of stuff to check. What we recommend is trying one solution at a time, starting with the easiest, which is to move around on the seat occasionally to change the pressure points while pedaling. And, to stand at regular intervals to take all pressure off the crotch. Many cyclists get in the bad habit of sitting in one spot on the seat. That’s fine, if it doesn’t cause problems. When numbness sets in, though, that’s plenty of incentive to get moving and standing every fifteen minutes or so on rides. Seat position is important and easily adjusted. The seat top should be level or angled for comfort no more than three degrees up or down. And the seat should be set high enough (but not too high), so that when the balls of your feet are over the pedal axles and your feet are at the bottom of the pedal stroke, your knees are slightly bent. If, at the bottom of the stroke, your knees are locked or nearly straight, it means the seat is too high, which could be what’s causing the numbness. When a seat is too high, you can’t support as much body weight on your feet, which means a concentration of pressure on the seat, causing numbness. Cycling clothing increases comfort, too. Riding shorts are made without seams in the crotch area. Plus a generous amount of padding is built into the seat and moisture-moving fabric is used to pull sweat away from the body. These features practically eliminate friction and chafing while the seam-free construction ensures that you’re not sitting on a bump that cuts off circulation and causes numbness. If all these things check out and you still suffer numbness, the likely culprit is the specific shape or composition of your seat. Fortunately, there are plenty of new models available designed for comfort. All you’ve got to do is find one that’s right for you, which is usually a matter of trying a few. We have an excellent selection and are happy to advise you. Hopefully, this advice will end the numbness. Let us know if we can help in any way. Cycling shouldn’t hurt! ll the scientific evidence we’ve seen indicates that the answer to this important question is no. Cycling is one of the best activities for fun, good health and fitness and there’s no reason to worry about sitting on a bike seat. But, if you’re uncomfortable in any way when sitting on yours, and you’re pretty sure that your saddle is adjusted correctly (improper adjustment is one of the most common causes of discomfort), we recommend considering a new seat. We also recommend wearing a cycling short with padding. Why? Because, there have been impressive advances in seat technology in the last couple of years and we have many new models specifically designed to eliminate pressure on sensitive body parts, which is probably what’s annoying you. These cool seats employ shapes, shock absorption and padding specifically selected to prevent pain and increase comfort and many happy customers swear by them. If you’re new to cycling and it hurts to sit on your seat at first, it’s not likely to cause any serious damage. Keep your rides short and see if the discomfort subsides after a few days. If the pain continues or worsens, call or come visit us right away for suggestions. One of the new breed of saddles, or some fit adjustments, can make all the difference and make riding enjoyable again.